The fall, winter and spring brings lots of fun with preschool story time. We enjoy celebrating events and holidays such as Thanksgiving, Dr. Seuss’s Birthday, Christmas and more. Each Tuesday, stories and crafts are planned and enjoyed by all. Parties are abundant. Our public computers are kid friendly with games galore. Each summer the staff plans a six week Summer Reading Program filled with games, special visitors and crafts. Ages range from three to fourteen. It is planned Tuesday through Thursday from 3:00 pm to 4:00 pm. 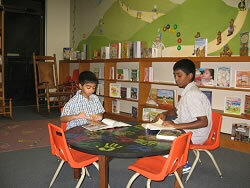 New books are enjoyed, read by the parents and the older children themselves.